The Aircraft Interiors Expo that took place last week in Germany was giving us so much hope for the future of air travel that, for a beautiful but short time, we thought we may start to enjoy flying. First, they came up with sleeper bunks that fit in the cargo bay for us to be able to sleep comfortably; and later, they suggested that airplane bathrooms be fitted with bidets for travelers to keep a clean tooshie while in the air. But, in a sick twist, the expo turned its back to travelers’ comfort and suggested it may be time for us to stand while flying. 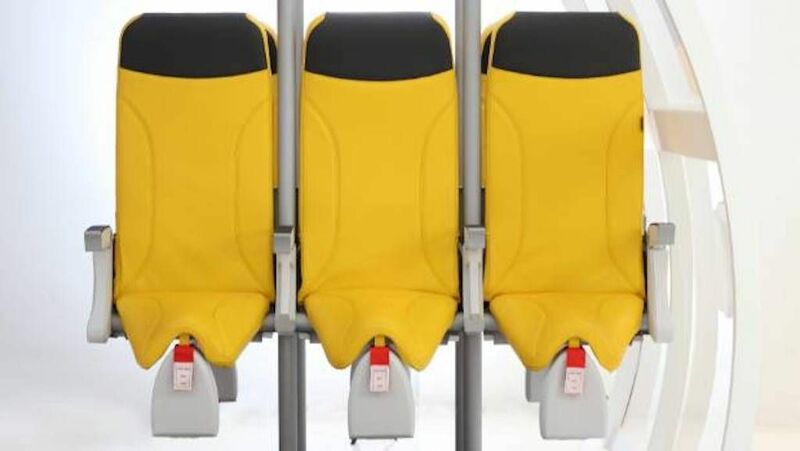 Aviointeriors, a company that designs and produces aircraft cabin interiors and passenger seats, thought it may be time to cram a few more people in the economy class (20% more to be exact) and came up with Skyrider 2.0, a passenger seat that looks very much like a saddle with a back. CNT explains that passengers using Skyrider 2.0 will have their feet on the ground and their legs straight while leaning their backs and riding their seats. Sounds cozy, eh? Although Skyrider 2.0 is meant for short-haul flights, it stills seems a like an instrument of torture for frequent flyers. The future of air travel does not seem so bright after all.